Some nights just end sour and on a heartbreak. In the case of the Salt Lake Stallions, they’ve felt this pain before. While quarterback Josh Woodrum performed admirably under center, a simple mistake cost the team a chance at victory. 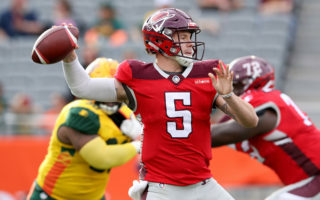 After a month-long trip away from the Alamo City, the San Antonio Commanders return home to the Alamodome to face the Salt Lake Stallions in a Western Conference showdown. Charlie Montoyo thought he would be taking a hard line against video games in his first year as Toronto Blue Jays manager. The first pitch for the San Antonio Missions’ tenure in AAA is just weeks away.